See the Membership section for more information on becoming a full Club member. You can also join our online forum for free! Use the Register option to join in with the Forum Discussions after reading the Forum Rules which will be displayed. Please feel free to browse or use the various links shown in the menu. Most of all - enjoy your time here and come back again soon! 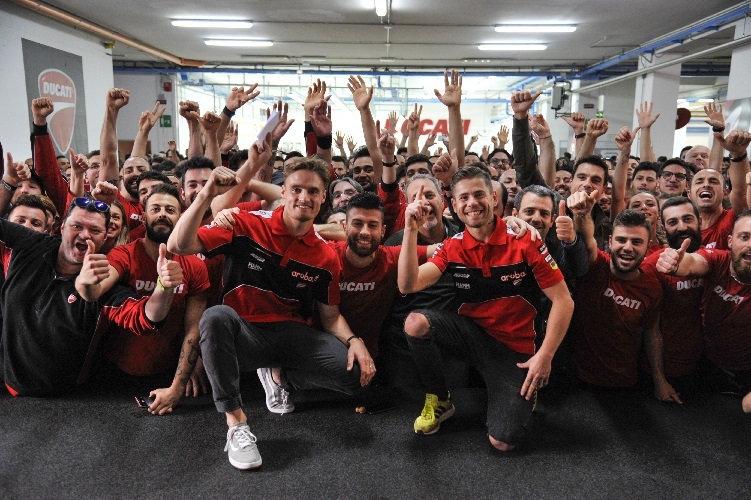 Yesterday, at the Ducati factory in Borgo Panigale, the two factory Superbike riders – together with the entire workforce of the Italian manufacturer – celebrated the prestigious milestone of 350 wins in the Superbike World Championship, which was achieved in the third race at Aragón in Spain on 7 April. Today was another memorable day for the championship leader Álvaro Bautista (Aruba.it Racing - Ducati), who added another two victories to his start-of-season winning streak. With success in both races, the 34-year-old from Talavera de la Reina took his number of wins to eleven, equalling Jonathan Rea’s record set in the second half of last season. • A fleet of up to 20 of the new Diavel 1260 will be available to test ride. • The Multistrada experience features test rides of both the Multistrada 1260 and the Multistrada 950. • Acquire some off road skills and test the Multistrada 1260 Enduro with instructors from the DRE Enduro Academy. • The Ducati roadshow will be in attendance with selected models from the Ducati and Scrambler ranges. • Claudio Domenicali, CEO Ducati Motor Holding: "Our operating profit is confirmed at the end of 2018 and Ducati will continue to build on fascinating new products." • Oliver Stein, CFO Ducati Motor Holding: "Concentrating on high margin motorcycles maintains our qualitative operating margin level." Borgo Panigale (Bologna, Italy), 11 March 2019 – Enrolment has reopened at the Ducati Riding Academy. Providing courses and experiences since 2003, the Academy has let more than 10,000 motorcyclists from all over the world hone their riding skills on a Ducati. Most users ever online was 1050, 07-Nov-2018 at 08:26 AM. 1098R Bayliss Rep - good investment? Powered by vBulletin 3.5.4 - Copyright © 2000 - 2019, Jelsoft Enterprises Ltd. - © Ducati Sporting Club - All times are GMT +1. The time now is 11:23 AM.